The Knotted household has been living in chaos since a leak through one of our ceilings back in the summer. We are almost back to normal, but dealing with the fall-out means my contribution to Four-in-Art this quarter is going to be delayed. 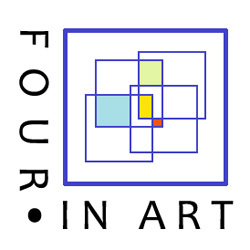 Thanks to my fellow Four-in-Arters for being so kind and understanding! Please do visit the other participants at the links below. This is our last quilt of the year inspired by the theme of 'Literature'. Each of us has taken this theme and run with it in our own way, and seeing how everyone else has responded to it has been such a lot of fun. Sorry to hear about your unfortunate situation Catherine! I, for one, have missed having your contribution to this round. You always come up with something interestingly and technically handled. I hope there is an end in sight! Oh no! What a hoo ha! Sorry to hear and look forward to seeing what you come up with when you can see your way. I hope your home is soon back to normal! So glad to hear that things are almost back to normal. We missed you in the ATC swap too.